With both sides unbeaten so far this season, ‘Ensians knew that they had to be at their best to pull off a win against the side relegated from the higher league last season. Unfortunately, they were beset by injuries again early on which caused disruption. Although the hosts played well in parts, they squandered two try-scoring chances in the first half, missed several kicks at goal and lost a player to the sin-bin during a crucial time early in the second half. On a warm, sunny afternoon, the visitors were the first to apply pressure taking play into the home 22. Quick re-cycling of the ball saw them cross the line on 4 minutes, but the player was held up. They continued to threaten and eventually took the lead after 10 minutes with a well-worked try wide out to give them a 5 – 0 lead. The home side began to settle, but suffered a blow when a few minutes later centre Luke Freer had to leave the field with a recurrence of his “dead leg” from the previous week. He was replaced by Ali Fothergill who himself had to go off ten minutes later with a knock to his leg. Despite these setbacks, ‘Ensians were now putting some good phases of rugby together. 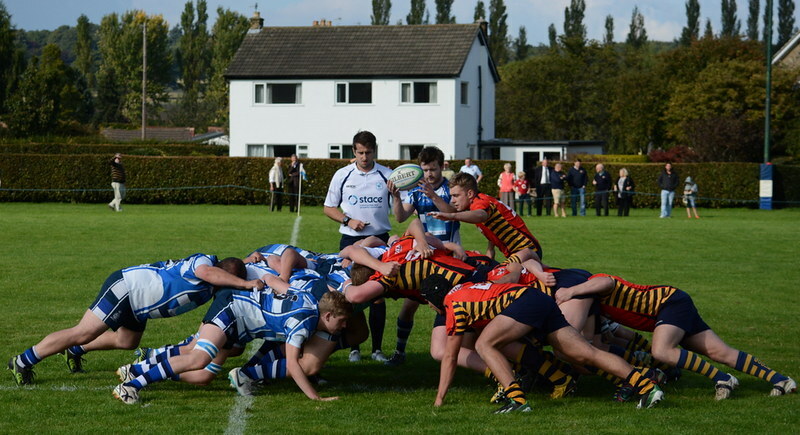 The front row of Simon Hill, Jim Dyson and Michael Groves dominated the scrums, disrupting the opposition ball and generally making life difficult for the Goole half backs. In the lineout lock Ali Campbell and flanker Sam Featherstone were producing clean ball so there were opportunities for half backs Rob Lofthouse and Ollie Eaves to get their backs moving. A long kick to the corner by home full back Kristian Keinhorst signalled a period of pressure on the Goole line. Several driving mauls failed to produce a score and when the ball was move wide, the visitors’ defence was up to the job. A kickable penalty was missed and frustration mounted as two clear chances went begging due to hurried passing and jittery handling. In the end, a move in the corner came to nothing, but it resulted in a turnover for Goole and they sent their lively backs away upfield. Desperate cover tackles halted the centres, but the visitors’ fast winger dived over in the corner on 29 minutes to stretch their lead to 10 – 0. John Offer came on as replacement for Fothergill with a further shuffle round in the backs, but this heralded a change of tempo as the home side began to attack to Goole line through good driving by the forwards and direct running by the backs. Camped in the corner, the hosts mounted a series of forward drives, but a poor handling saw an easy a chance go begging. Things improved a few minutes later when a powerful drive allowed rampaging prop Simon Hill to cross half way out on 35 minutes. The conversion failed, but ‘Ensians were very much back in the game at 5 – 10. The home side continued to press through Hill, No.8 Rob Arbuckle and locks Campbell and Jack Smith. 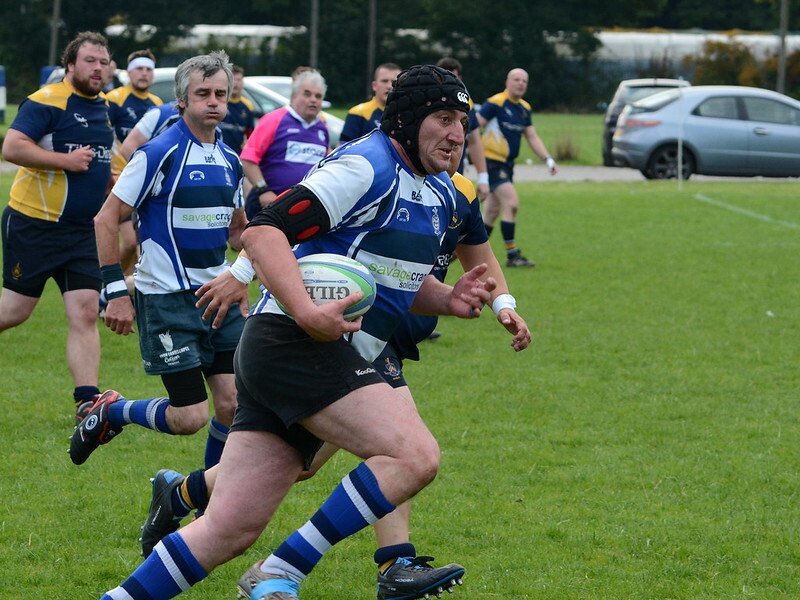 With the home scrum trundling forward towards the line, the visitors blatantly infringed and the referee had no hesitation in awarding a penalty try. The conversion by Keinhorst gave the home side a well-deserved 12 – 10 lead at half time. After the break ‘Ensians continued where they left off, on top in the scrums along with good ball from the lineouts. Again a good scoring chance was missed when a pass went astray and then Goole gradually worked play into the ‘Ensians’ half. During this period of pressure the hosts had a player sin-binned which encouraged a greater effort from the visitors who got their speedy backs away to score their third try on 53 minutes to re-take the lead at 15 – 12. Fothergill was able to return to help out in the pack and again the home forwards were able to work the ball into the Goole half to give their backs opportunities. Centres Luke Cowdell and Josh Howarth ran hard, but there was no way through as the visitors’ defence held out. Quick possession for the visitors once more saw their fast backs put together a sweeping move to produce a try against the run of play. The conversion took the score to 22 – 12 on 73 minutes and a long-range penalty a few minutes later moved the advantage to 25 – 12. The home side was far from finished and good driving work by the forwards set up a platform for centre Josh Howarth to go in at the corner. The conversion failed leaving the final score at 25 – 17 to the visitors. This was a game where ‘Ensians played good rugby for long spells against a good side. Unfortunately they missed chances for both tries and kicks which in a tight game such as this would have made a big difference.